CBS Sports reported on Tuesday that Davidson and Kansas would face-off at the Sprint Center in Kansas City as part of both teams’ 2016-17 non-conference schedule. The game will be played on December 17th and will be a huge early season boost to the Wildcats’ RPI. Kansas will likely be a Top 5 team in the nation next season, so this game will certainly be a challenge for Davidson. Though this is technically a neutral site game, the crowd will certainly consist of more Jayhawk fans than Wildcat fans. Kansas will play Davidson at the Sprint Center in Kansas City on December 17th, sources told @CBSSports. Though Kansas loses some valuable talent from last year’s team that lost in the Elite 8 to Villanova, it will bring in enough firepower to have a run at the National Championship this coming season. Guards Frank Mason III and Devonte’ Graham will be returning along with forwards Landen Lucas and Carlton Bragg Jr. In addition, the Jayhawks add some enormous talent with 5 star freshmen Josh Jackson and Udoka Azubuike. 5 star freshman Jarrett Allen has yet to make his decision, and if he commits to Kansas, the Jayhawks will have a case for preseason #2 right behind Duke. 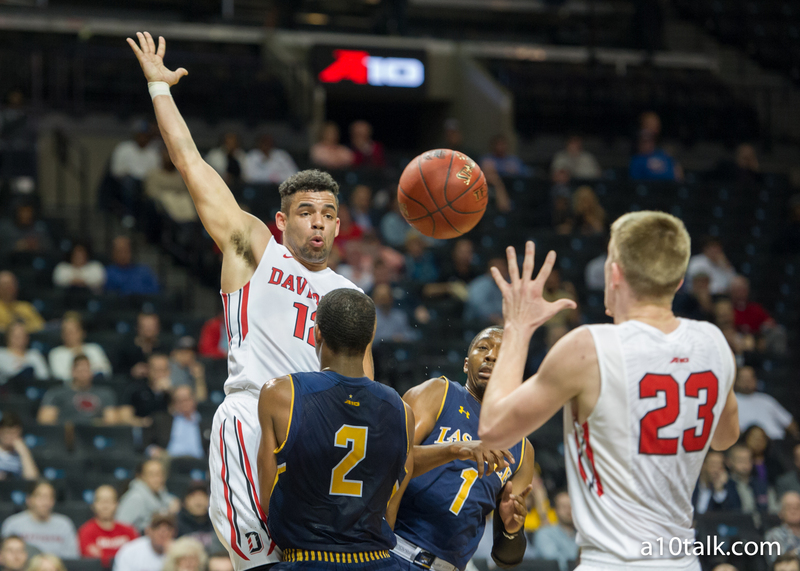 Davidson returns a lot of talent from last season and could be the biggest sleeper in the A-10 this coming season. The Wildcats will have Jack Gibbs and Peyton Aldridge back on the floor to lead the way, and Davidson also returns rising talent in Nathan Ekwu, Jordan Watkins, Rusty Reigel, Andrew McAuliffe, and Oskar Michelsen. The Wildcats will be the underdogs in this game, but if they can get hot from three point range and hold their own in the paint, they could really make this game a contest. Win or lose, this will be a great way for Davidson to see some tough competition before entering Atlantic 10 Conference play. Between all these Tournaments, and “big” OOC games, the majority of the A10 Teams are scheduling for this coming season, it looks like collectively everyone has decided to “not” let the NCAA Committee have any excuse to leave deserving teams out of the Dance! Not only will this be huge stepping stone for the A10 to gain more respect, it should once and for all, show that this league is no middling Mid-Major, but just as solid (if not better from top to bottom) than the American, and even the Big East, and SEC. Villanova and Xavier are obvious standouts, with Seton Hall being up there too, in the Big East, but the A10 has atleast 5 teams that are arguably better than anyone else in that conference. While in the SEC has Kentucky and Florida who are perennial powerhouses, with Texas A&M and South Carolina getting off to hot starts last yr (but against inferior competition), so again the best of the A10 could hang with majority of those SEC programs. And finally the American conference, who have teams such as UConn, Temple, Houston, and SMU. But does anyone really think that the American conference is any better than the A10?! UConn takes their dominant role once the postseason roles around, and SMU is a very dangerous team, but i would put Dayton, VCU, St. Bonaventure, Davidson, Rhode Island (finally healthy), and GW, up against those teams on any given night and day!.. This could be the year the A10 shows the rest of the Nation, what we the fans already know, the A10 is one Conference not to be taken lightly anymore!..